Students are encouraged to complete their registration online (ww.aiub.edu) from outside (home, cyber café, etc.). Payment has to be made WITHIN 24 HOURS of registration confirmation. Take a printout of your payment slip and go to the following banks to pay your tuitions. 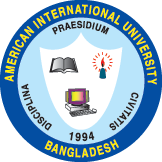 Students outside Dhaka are requested to send a pay-order in the name of American International University-Bangladesh to ‘Accounts Department’, AIUB, 83/B, Kemal Ataturk Avenue, Banani, Dhaka 1213, by registered postal mail and send an e-mail to osa@aiub.edu for the confirmation of payment. The students are encouraged to complete their pre-registration online (ww.aiub.edu) from outside (home, cyber café, etc.). Payment has to be made WITHIN 24 HOURS of registration confirmation. Take a printout of your payment slip and go to the following bank to pay your tuitions.